& Lab research assistants Jennifer Ha (left) and Megan Golson (right) presenting at the Rocky Mountain Psychological Association annual conference in Denver, Colorado! Here is a recent publication the &Lab contributed to! For this article, Dr. McClain Verdoes collaborated with Drs. Jeffrey Shahidullah (Michigan State University), Katherine Mezher (Miami University), and Sarah Schwartz (Utah State University), as well as graduate students Cassity Haverkamp and Kandice Benallie. Click here if you would like to read it. Check out the new publication! For this article, Dr. McClain Verdoes collaborated with graduate student, Monica Muncy, and Dr. Sarah Yoho from the Speech & Auditory Perception (SAP) Lab at Utah State University. 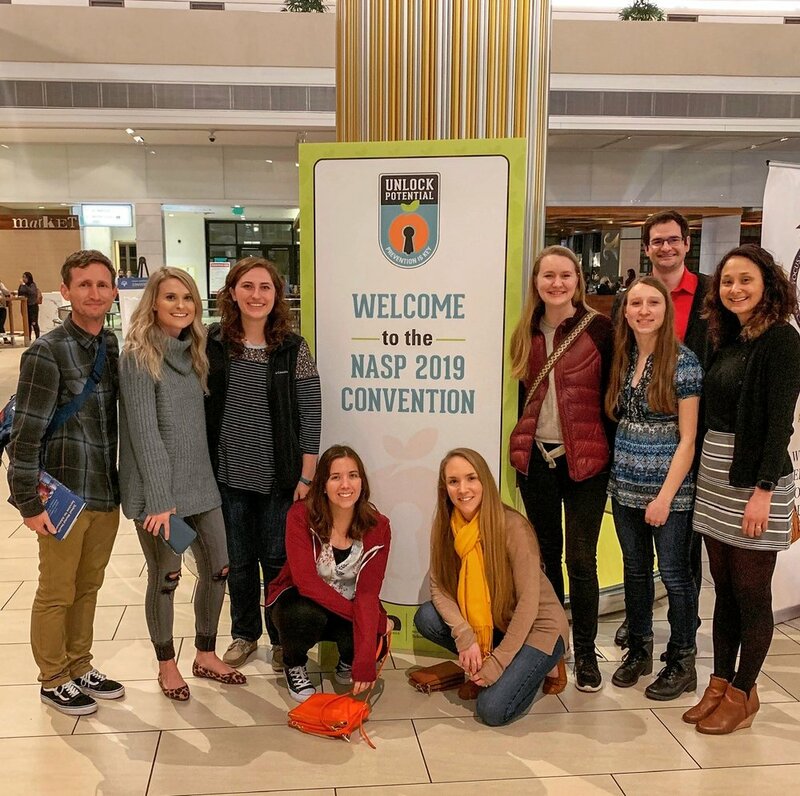 Utah State University was well represented at the 2019 National Association of School Psychologists (NASP) Conference in Atlanta, Georgia! The & Lab had eight presentations this year. Drs. McClain Verdoes, Katy Mezher (Miami University), Jeffrey Shahidullah (Rutgers University), Laura Lee McIntyre (University of Oregon), and Jonathan Safter-Lichtenstein (University of Oregon) at APA in August! They will be conducting a symposium on the collaboration between the educational and medical homes in service provision for students with ASD. Check out the new publication! For this article, Dr. McClain Verdoes collaborated with Drs. Julia Strait (University of Houston- Clear Lake), Peg Dawson, Christine Walther (University of Houston-Clear Lake), Gerald Gill Strait (University of Houston- Clear Lake), and Amy Barton (University of Huston). Make sure to check out the following link to The Harald Journal, where Maryellen McClain Verdoes served as a guest columnist on an article about school psychologists and how they help prevent suicide. Check out the new publication in Clinical Pediatrics! Dr. McClain Verdoes collaborated with Drs. Shahidullah (Rutgers the State University of New Jersey), Azad (Johns Hopkins), Mezher (Miami University), and McIntyre (University of Oregon) on a commentary discussing linking the educational and medical home when serving children with ASD. 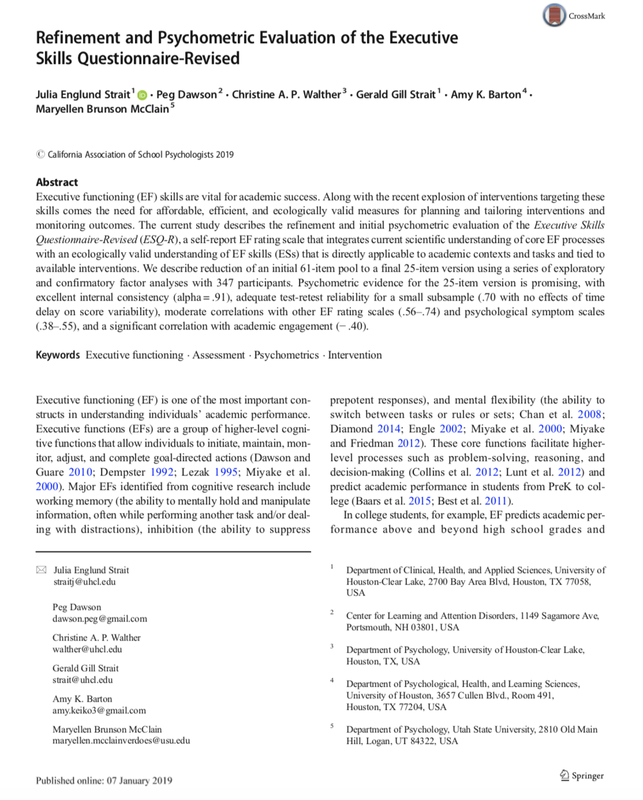 Dr. McClain Verdoes and two & Lab graduate research assistants (Cassity Haverkamp, Fiona Molsberry) recently collaborated with Dr. Otero (University of New Mexico Center for Development and Disability) on their most recent article published in Psychology in the Schools. 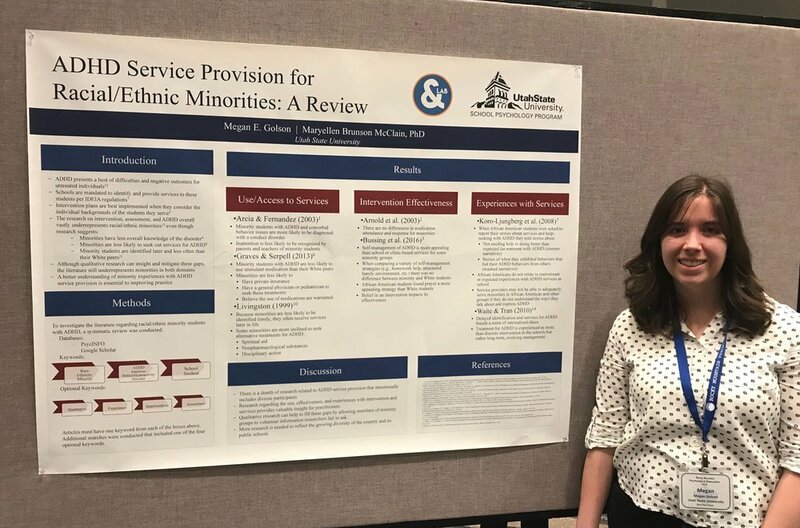 & Lab graduate research assistants Chandler Benney (left) and Kandice Olson (right) presenting at Rocky Mountain Psychological Association in April! Several & Lab research students traveled to Chicago for the National Association of School Psychologists (NASP) annual conference. & Lab graduate research assistant Cassity Haverkamp presented a poster on the effectiveness of various emotion identification interventions for students with ASD at the NASP. SPRL research assistants Chandler Benney, Kandice Olson, and Cassity Haverkamp exploring Chicago while at NASP! Cassity explaining her research at NASP. Cassity at her poster at NASP. URLEND and Riley Hospital for Children LEND trainees and Dr. McClain Verdoes at their AUCD poster presentation. #AUCD 2017 - Dr. Maryellen McClain Verdoes presented on assessing LEND trainees knowledge of ASD with occupational therapy and psychology trainees from Utah regional LEND, Riley Hospital for Children, and Indiana University at AUCD in Washington, DC. Nice interdisciplinary and cross university collaboration everyone! Check out our most recent publication! Inattention and hyperactivity/impulsivity among children with attention-deficit/hyperactivity disorder, autism spectrum disorder, and intellectual disability by Drs. McClain Verdoes, Hasty Mills (Glenwood Autism and Behavioral Health Center), and Murphy (University of Tennessee Health Science Center). Cassie Bovee, undergraduate research assistant with the Speech and Auditory Perception Lab (SAP LAB) at Utah State University, presented on the effects background noise has on speech perception for children who have ASD at the USU Student Research Symposium today! The & Lab and SAP LAB are collaborating on an on-going project examining the effects of background noise on speech perception and reading performance in children with and without ASD. Excited to announce that Maryellen McClain Verdoes and Cassity Haverkamp will be conducting a workshop on differential diagnoses during the ASD assessment process at the Brigham Young University Autism Translational Research Workshop in January!